Transparency Market Research, a U.S.-based market research and intelligence firm, announces the release of a new market research report detailing the global synthetic and bio-based lubricants market. The report, including information gathered from primary and secondary resources combined with input from industry experts, is titled ‘Synthetic & Bio-Based Lubricants Market - Global Industry Analysis, Market Size, Share, Trends, Analysis, Growth And Forecast, 2012 - 2018’. The detailed data in the report is presented with the help of reliable analytical tools such as Porter’s five forces analysis and SWOT analysis, and includes voluble elaborations on the growth drivers and restraints acting on the global synthetic and bio-based lubricants. 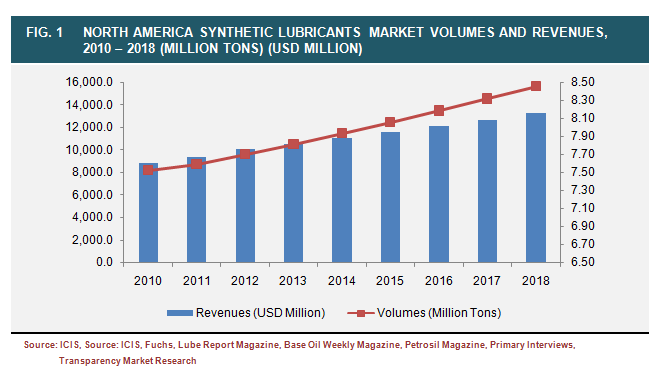 According to the data presented in the report, the global synthetic and bio-based lubricants market totaled 45 million tons by volume and generated revenues of US$45 million in 2010. The market is expected to expand at a CAGR in excess of 2.2% in terms of volume from 2012 to 2020.The factor primarily responsible for this expected growth is the increasing regulatory support all over the world for bio-based alternatives to petroleum-derived products. Growing acknowledgement of climate change and the role of human activities in it, and our consequent responsibility in reducing the harmful effects of it on the environment, has led several governments to provide incentives to bio-based lubricants. This, allied to the increase in the usage of synthetic and bio-based lubricants in the rampant global automotive industry, is expected to drive the global synthetic and bio-based lubricants market in the forecast period. However, the report also provides an impact analysis of the factors that threaten to hinder the growth of the global bio-based lubricants market. The higher cost of bio-based lubricants in comparison to synthetic lubricants and volatility in the prices of mineral oil is expected to check the growth of the global synthetic and bio-based lubricants market.The report segments the synthetic and bio-based lubricants market into the two eponymous segments, both of which are further subdivided to provide the market snapshot of each subcategory. According to the raw material used, the market is divided into five categories: crude oil, palm oil, castor oil, sunflower oil, and others, including plant oils such as soybean oil. The bio-based lubricants market is divided into the categories of vegetable oils and animal oils. The synthetic lubricants market is divided into industrial synthetic lubricants, commercial automotive synthetic lubricants, and consumer automotive synthetic lubricants. Each of these three categories are divided thus: Industrial synthetic lubricants are divided into process oils, general industrial oils, industrial engine oils, metal working fluids, and others; the commercial automotive synthetic lubricants segment is further broken down into heavy-duty engine oils, gear oils, grease, and hydraulic and transmission fluids; and the subcategories of gear oil, grease, automatic transmission fluid, and passenger vehicle engine and motor oils are formed within the market for consumer automotive synthetic lubricants. The report provides volume and revenue projections for each segment for the period from 2010 to 2018.The report also provides detailed information on the growth projections of the various application segments of the synthetic and bio-based lubricants, such as automotive oils, lubricating greases, and compressor oils, and the end-use industries of synthetic and bio-based lubricants, including industrial, commercial transportation, and consumer automotive. The report also includes extensive information on the key players in the global synthetic and bio-based lubricants market such as BP plc, Chevron, and Exxon Mobil Corporation, including financial overview, data gained from SWOT analysis, and information about their business strategies and recent movements in the synthetic and bio-based lubricants market.